On my travels I experience the most wonderful people in the world - leaders. I will use this space to share their work and all that they have taught me. If you are a leader attempting to create dramatic contextual change in your organization you will quickly have a new friend for life; a friend who hops up on your shoulder and whispers in your ear, “Hello, I’m your new best mate and my name is RESISTANCE.” As a leader, if you ignore resistance, it will infect and destroy any change attempt. Within every organization there is a solid and seemingly unified contingent wearing tee shirts that say, “This too shall pass.” Unattended, resistors and their cousins will carry the moment and a compelling vision will not be enough to get the job done. Can you see your resistors? Do you know who they are? Do you attend to them? How? When I moved into leadership, wide-eyed and bushy-tailed, three decades ago, resistors were my biggest surprise. They can come in all sizes and shapes and be anybody. Sometimes, all I needed to do to see a resistor was look in a mirror! A few have been members of my leadership team. Quickly, I realized resistance would always be an important part of my life, like a genetic disease akin to diabetes. It would never go away. I had to learn how to live comfortably with the resistors. It became an issue of how to mute their power and support them in making the personal choice of commitment. WE HAVE A RIGHT TO ASK FOR THAT COMMITMENT! My friend and partner, John Edwards, says it best, “All of us need to be clear about what we draw a salary for. Anyone who draws a salary to work at our organization is expected to work hard to help our organization achieve its vision, and maybe some people need to be reminded of this.” Supporting resistors in making the personal choice of commitment is bloody hard work. Ignoring them or running away from them will destroy any improvement effort. AS A LEADER, DESIGNING A PROCESS TO DEAL AND LIVE COMFORTABLY WITH RESISTORS IS CRITICAL. This post will detail the process I have evolved over the years to deal with resistance. It is one man’s story. Many of you have created your own stories and are expert at this. What are your successful strategies for dealing with resistance? To deal with resistors you must understand their source of power. This power normally resides in one of four platforms. 1. Our organization has been down this path before. 2. Our organization may be committed, but the federal, state and regional offices are not. 3. Prove to me that the leadership team supports this. 4. If I go along with you, how long will you or I (us) be around? These are compelling platforms for two reasons: first, there is truth in what they say and second, they speak for each of us. Resistors have often been the voice of my own doubts! They often have history on their side. They have the data to prove that other attempts to change the organization have passed in the night. They put into words the doubts we all have. Resistance is disbelief, a loss of faith in the sincerity or goodwill of others. What resistors seek is a promise we can never give them. They want us to reassure them that we can provide a safe and successful future. We cannot choose adventure (your shared vision journey) and then promise safety to get people to come with us. The resistor has two first cousins, the victim and the bystander. They form different kinds of resistance because they run on different fuels. Victims will claim that it is not within their power to make the changes required. They will point to a multitude of reasons for this. These reasons are never “their fault”; someone or something else is always responsible. Bystanders enter the game by withholding commitments. They want proof that this will work. Your shared vision journey is filled with uncertainty. You can never offer the proof a bystander requires. Have you identified the types of resistors in your organization? Try classifying your resistors according to the framework just presented. This data will be helpful as you design strategies to deal with them. What follows is my design. I have not numbered my strategies because they can occur in any number of sequences. This is not magic and it wasn’t always successful. The evolution of the design allowed me to live comfortably with resistors and their cousins. We need to find a way to evoke faith, responsibility and commitment in ourselves and those around us and at a minimum, keep the resistors, victims, and bystanders from controlling the emotional environment and undermining our efforts. We need a way to be deeply respectful of them and at the same time prevent them from having the undue power they sometimes gather. Our instinctive response to resistance is to argue. We want to persuade the resistor that this change will be special. Efforts to sell the new age to a resistor by argument always are futile. There is a reason you can’t argue with a resistor. There is some validity to what they say. They put into words doubts we all have. For these reasons we cannot argue or barter with resistors. The more we argue the stronger they become. Resistance is disbelief, a loss of faith in the sincerity or goodwill of others. How can you argue or barter for faith? We cannot coerce resistors. We need to believe that faith, responsibility, and commitment is a matter of personal choice. Even though history may be on the side of the resistors and their wounds are real, they can choose to have faith in the face of that experience. This is the invitation we make to them. We need to affirm their version of the history and support them in their doubts. We replace coercion and persuasion with invitation. One verbal resistor in a room of fifty can set the tone and carry the day. We really don’t need resistors to join our effort because we already have a critical mass that will do that. We want to contain the influence resistors have over others. Never allow resistors to have a public audience. I planned for this in designing meetings. I never allowed argument at a staff meeting. I would explain that we had only a precious few moments to spend together as a staff during the year and that these needed to be positive moments. Argument simply wastes everyone’s energy and no good will come of it. This was proven at my daughter’s secondary school where she teaches recently. Her principal chastised the staff about rumors. The public argument that followed fractured the school climate like a stone being thrown through a plate glass window. That kind of meeting becomes an infectious disease. When I first moved into leadership, I was fortunate to be mentored under a wonderful leader. In my first conversation with him he taught me a lesson I will never forget. He explained that my responsibility was to assist him in being a great leader for the organization, even when I didn’t agree with him. Further, he expected me to use my strengths to compensate for his weaknesses. If I would remember that advice my career would flourish. I did and it did! Through him I learned that behind closed doors we could argue and debate strategies and issues until we were blue in the face. But, once we opened those doors our staff would need to see and hear a leadership team that spoke and acted as one mind, one voice. When you are not, you create an environment where resistors flourish. If you are not of one mind, one voice, the resistors will drive a Mack truck through the hole. Resistors on leadership teams are especially dangerous. In my career worked with twenty-five different leadership team members. I am proud that fifteen of them moved to the next level of their careers while working with me. Three retired happily. Four were resistors. How do you handle resistors on your leadership team? We cannot allow those closest to us to be Mack trucks because they can destroy our efforts instantly. Like other staff members we must support them in making the personal choice of commitment. And remember, WE HAVE A RIGHT TO ASK FOR THAT COMMITMENT. I don’t believe there are any throwaway people. I continually invited my leadership team resistors to make a commitment. Those commitments were forged as partnerships. WE continually designed agreements of how we would work together. This was a written design. WE continually created the parameters of our responsibilities to one another. These were written parameters. WE continually met to gather and share data related to our agreements. After time, if the data proved they were not willing to commit, I would ask them to leave. In my personal history with leadership resistors; instantly in one case, after four years in another, three years in another, and 2 years in the last, they left. My first CEO removed the first resistor for me by transferring him. Two retired gracefully. The other resigned as I prepared to fire him. Being of one mind, one voice is serious leadership work. Nothing less should be accepted. Seek to understand your resistors so you know where they fit on the framework I described earlier. Facilitative Questioning is the most powerful tool I have ever learned for doing so. I continually looked for opportunities to engage resistors in Facilitative Questioning episodes allowing me to construct MY version of THEIR truth, their values, beliefs and assumptions. By questioning resistors, I came to understand their history and their passions and could identify the kind of resistor I was dealing with. A good question to start with is: “Help me understand where your behavior is coming from?” This should come after you have shared clear data. Another good question is: “If you were the leader and you saw this behavior in a staff member (or leadership team member) what action would you take?” The key in Facilitative Questioning is to leave the responsibility with the person who should hold it. DO NOT try to fix them up, just help them reflect on their behavior. There are two phases to the conference. First, I ask the resistor what they are going to commit to do to help us on our shared vision journey. Next, I ask what they will need from me to be successful. When we are done I have a clear understanding of how I will need to continue to support each of my resistors and the data we need to generate to know if we are honoring our partnership agreement. If a resistor, over time, would not engage in making choices to fulfill our partnership agreement, we would gather and share data, reflect through facilitative questioning with them regarding that data, design new action plans from that reflection, and coach them through the action plan. If over time, you are unable to mute the power of resistors and they are destroying your shared vision journey, they must be asked to leave. Those are not easy decisions, but the shared vision is your organization’s power. In twenty years I dismissed one employee and then there was that Leadership Team who resigned first. Many people left of their own volition, because of the process just outlined. In some cases my support of the resistor included helping him or her find an appropriate place for their work. The sum total of working this process to deal with resistance over the years acted as a muffler on my contingent of resistors. And it was always a great joy when a resistor accepted the invitation to commit. A few letters from resistors who committed are among my most treasured possessions in my career. Finally, I could surmise that I spent so much time with resistors that many of them have become life-long friends! Real change means becoming something radically different tomorrow than you are today. We can make the case that this kind of transformation is rare, especially in schools where the status quo has prevailed. I believe the reason for this is that the work of real change is very confronting, individually and collectively. The angst, confusion and frustration of real change is not easily embraced in any organization and in schools stifled by the status quo massive resistance and fear exist. That is why being a member of the International Network of Community Designed Education (Teacher Designed Schools in Australia and New Zealand) co-founded by Dr. John Edwards and I in 2003 is both exhilirating and confronting at the same time. Our processes embed all of the attributes of real, contextual change that exist in "Best Practice" research today. What follows is a description of that research and how we include those attributes into our professional work. Michael Fullan has two new books out: All Systems Go: The Change Imperative for Whole System Reform, (Corwin Press, 2010) and Motion Leadership: The Skinny on Becoming Change Savvy, (Corwin Press, 2010). These books spell out that fundamental change must include total engagement, that everyone is engaged – whole school reform. Professional learning has to include everybody; otherwise, you only get piecemeal change. The Network processes meet this need for total engagement. From building the shared vision and engaging in the research of the Preparation for Action year to the mental model work of implementation, everybody is influenced to be engaged. Fullan mirrors Peter Senge’s concepts of “less is more” and “slower is faster.” As the school leader, according to Fullan, your role is to mobilize the whole group around a small number of powerful initiatives/tasks and then making sure the school is in a network of schools where the schools are learning from each other. His “skinny on change” is identifying the smallest number of key factors that you need to focus on, factors that are high-powered, in the sense that if you do them together, you’ll see lots of results for the efforts. The leader mobilizes the group to work together and excites people who are there to collaborate to do something different that they find satisfying and energizing. Long before Fullan came to this conclusion we had built these concepts into the Network processes. This is especially observed at the beginning of Phase 2 where every school is encouraged to design a sensible long-term improvement plan where “speed” must always be based on the mental models you are trying to embed into the culture of the school. The Network provides opportunities for learning with like-minded colleagues around the world who speak a common language. This is powerfully obvious at our annual Network Leaders’ Days. The “pit” must be seen as an absolute necessity for change and learning. As Edward’s and Butler’s research shows us, feeling frustrated, uncomfortable and anxious is a vital ingredient for learning. All contextual change flows through a shift in mental models; the values, beliefs and assumptions that drive our performance. These mental models are resistant to change. Choosing to live out a new mental model means we will “get worse before we get better” according to the Model of Transformational Learning. This is the storming stage in the life of healthy learning, either individually or collectively. School leaders must create the conditions for a collective storm in order for contextual change to be a reality. They must also hold their nerve during the storm. The TDS/CDE Network processes provide schools a structure that ensures challenge influences the learning process. It is the Preparation for Action Year. A time to storm is validated and the conditions that influence contextual change are strategically designed into the process: answers are drawn out of those who know them best – the people doing the job, staff are provided a safe environment to try things out and fit them to their context, the power of the individual and group is used to bring contextual change to the surface, and school leaders provide the time, space and commitment for the challenge of the storm to be the school’s reality. In the preface to John Hattie’s new book, Visible Learning, Michael Fullan is referenced describing that the problem schools face is “not resistance to innovation, but the fragmentation, overload, and incoherence resulting from the uncritical and uncoordinated acceptance of too many different innovations.” Whole-school reform, contextual change, can only occur when a school community chooses wisely from the myriad of innovations Fullan speaks about. And that is only the first step. Whatever you choose must be fit to your context. Nothing can be directly implemented from elsewhere. Everything must be designed to fit your uniqueness. This takes time, iterations and trust in you. Then leaders must teach the mental models the community will need to embed the innovation into the culture of the school. Again, the TDS/CDE Network processes support you to fit contextual change to your context. This begins powerfully with the Core Value work during Phase 1. This becomes more readily apparent in Phase 2 and Phase 3 as you design your long-term school improvement plan and identify the implementation tasks and mental models that must be in place to realize your plan and shared vision. Processes like the Butler Model are used to support school leaders to design the mental model lessons they must teach to the school community. My apologies! This blog has been devoid of news for almost four months now and the emptiness coincides with my personal work schedule in Australia, New Zealand and Malaysia that covered 3.5 months of that void. I found it extremely difficult to write on the blog as I traveled to and fro. At the moment I am home in the Colorado Rocky Mountains with ample time to re-new my blogging efforts as well as plan how to maintain the blog as I travel. It’s all about self-discipline, Bill! During my most recent journey I was able to work and interact with over one-hundred leaders as I either worked with their organizations or presented at conferences they attended. Every one of them had a passionate desire to lead change. In some places I saw and heard dramatic stories of progress and in others the artifacts of struggle and the sounds of despair. As I studied my journal notes what were the recurring differences between those making progress and those who were not? • Vision - all leaders in the organization had a passionate commitment to the shared vision. Even in the face of opposition, the leader pressed ahead and was unwavering in support of the shared vision. • Power – leaders saw change as a political process. Politics is about power. The leader understood there are a variety of sources of power and knew how and when to use them contextually. • People – leaders knew their only important job was to develop their people. • Resistance to Change – leaders understood that there will always be resistance to change and never ignored it. • Models – leaders understood that behavior in the trenches is a reflection of leadership at the top. • Resources – leaders provided the resources to keep things moving. • Mental Models – leaders understood that cultural change only happens when staff changes their values, beliefs and assumptions. They knew this can only happen from taking action and reflecting on that action supported by immediate coaching and feedback. • Opinion Leaders – leaders know that some people’s opinions count more than others. They won these opinion leaders over and used them as leaders of cultural change. Leaders sought them out and involved them both informally and formally in the change process. As I watched these leaders and thought about real change, change where you become very different from what you are at the moment; it helped crystallize for me what characterizes real change. Later this week I will chat with you about that. It is nice to be back. Leaders need feedback. That is the only way to understand the values, beliefs and assumptions (mental models) that drive what we do each day. We cannot see these mental models by ourselves because we are looking back at ourselves with the same mental models. Many of our mental models are dysfunctional. Feedback allows us to “see” our mental models clearly so that we can align our daily actions around our functional ones and control the dysfunctional ones. Earlier this week I had the opportunity to follow a leader for four hours and provide her feedback regarding what I saw. A grand thank you goes to Mary Wilson, the principal of Baverstock Oaks School in New Zealand and a great leader, for allowing me to share the feedback with all of you! 7:20am – Lab drops Mary and me off at school. M. drops staff personal visioning portfolios into mail slots. M. greets a Teacher and introduces her to me. Shared vision and values displayed in conference room. Copies of Educational Leadership lay on coffee table. M. turns on quiet music in her office. 7:35am – M. begins puttering around her office – organizing and re-organizing. (Bill’s note: M. has not been at school since last Wednesday) She asks me if I want to appear on the in-house television program with her at 9:00am. M. walks her personal vision portfolio over to Genee’s (Deputy Principal) office. The two of them engage in light hearted banter about M. personal vision. 7:38am – M. begins to look at the mail on her computer. She files copies of her feedback on personal visions into staff files. M. walks a copy of her personal weekly calendar into her PA’s office. 7:43am – M. sits back down at her computer. M. continues to work on files and papers, makes a copy of a paper. 7:46am – M. almost bounces back into G. office. 7:49am – M. is filing, copying and checking her computer. 8:00am – M. moves into the front office. She has a chat with the receptionist and her PA about disseminating newsletters. M. to PA: How are you? M. gives directions to the PA.
8:03am – Back in her office M. discusses her mate, Murray, school’s tragedy from last year. M. describes all the lessons Murray taught during the tragedy. She gives more directions to the PA – send letters to families of kids leaving school. 8:11am – M. does more work back at her computer. 8:15am – G. walks into M. office. A short discussion of events later in the week takes place. M. begins walking tour of the school. M. greets most students by name. Continuously, students seek M. out for greetings. M. spots a boy who seems sullen. She works with him until she receives a positive greeting. 8:51am – Back in her office M. makes a quick phone call. M. types at her computer. 8:55am – M. is still working at her computer. 9:00am – G. reports to M. that her daughter was in a minor traffic accident on the way to work. The daily student television news show begins. their personal visions with her. Several staff sits in the staffroom watching the show. Mike, a teacher, watches M. intently. 9:10am – M. walks the new books down to the media centre. She engages the media specialist in a conversation about her recent illness. M. challenges her to stay home until she is better. 9:15am – M. “putzs” in her office; checks the computer and makes copies. 9:23am – M. back on computer. She continues to catch up on e-mails. 9:39am – Board Chair, Chris, comes in for scheduled meeting. M. distributes agenda. M. discusses sand for sand pit. M. articulates supporting observations for bids. M. and C. discover that the numbers are better than expected. 9:51am – M. describes two quotes for the new driveway. M. says, “This will be headed out to Allen. How it often changes people. (Bill’s note: Never look back or resent negative behavior. Other’s behavior is not about you. 10:15am – M. presents her personal goals for the year. A discussion of personal vision ensues.M. asks C., “When can you meet with my appraiser?” An agreement is reached. 10:23am – M. describes the Sisters School project. A discussion ensues. M. shows C. the paper she has written for the project and reads it out loud. M. says that the confirmation of the project must be done in person. 10:31am – M. discusses BOT folders, “I want them to be just right. The folder sample has to be perfect.” M. states they should go out the Friday of week 1 in new term. 10:37am – Conversation ensues regarding improving future BOT meetings. C. feels meetings must become more productive and enjoyable. 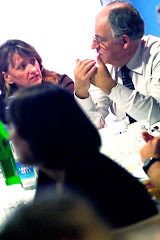 10:40am – M. and C. discuss a multitude of community issues. 10:45am – Meeting ends.We move up to the staff room for morning tea. M. re-introduces me to staff. 11:03am – We move into several classrooms to sit and watch for a couple of minutes. 11:22am – back in her office M. shares her plans for the remainder of her day with the PA.She catches up on computer. • You have developed an incredible symbols management program that dramatically tells the story of the school’s shared vision and core values. You articulated the designs you will be implementing to develop new symbols. • You absolutely model and articulate what you espouse. You have helped every staff member have a personal vision. Every contact you made with a staff member paid attention to them and their visions. You have developed your own vision. This influences your staff to be engaged in continuous deep personal learning. This is impacting your instructional program powerfully. Every teacher wants to engage every child in the same deep learning experiences. This personal attention to know your staff and students has created a world class learning culture. • I was struck by your physicality. Your kinetic energy is an asset as you lead. Your physical movements are so powerful they give you another “voice.” That movement influences others to action. • Be careful about holding on to the negative aspects of the past. No good will come from it; you will only drain energy and time. Always sustain creative tension regarding the future. • THE BEST I SAW WAS THAT NO ONE NEEDED YOU ALL DAY. EVERYONE AT THE SCHOOL HAS ASSUMED RESPONSIBILITY FOR LEADERSHIP. NOT ONCE WERE YOU INTERRUPTED ABOUT PROBLEMS OR ISSUES. BAVERSTOCK OAKS IS A COMMUNITY OF LEADERS. YOUR LEADERSHIP CAPACITY WITHIN THE SCHOOL IS INCREDIBLE! One could make the case that our current global crisis can be correlated to a global lack of leadership. Leadership is hard and rare. Author John Kotter believes that less than 10% of what happens in organizations is leadership and goes on to say those organizations are over-managed and under-led. In my lifetime there were six challenges I was continually trying to meet as I tried to be a leader. It is your struggle to figure out how to balance your leadership-management seesaw and those of your staff that determines your speed of change. More management means slow change. More leadership equals quicker, deeper change. How are you traveling at choosing leadership? Many days in our organizations, our greatest obstacle to growth and change is looking back at leaders from their mirrors each night. You must know who you are and what you stand for. You have these mental models, and they are damn resistant to change. Many are functional. Many are not. These are the ones that ought to give us huge warning signs, but we can’t see them without feedback. It is amazing how an organization often takes on the personality of its leader. Are you clear on the mental models your organization sees in you each day? Who are you getting rich feedback from? How have you action planned to control your dysfunctional mental models? Beware of the feedback you get from your “groupies”, staff members who think you are a hero. Feedback is not about having our egos stroked. Often the best source of feedback will come from your resisters. Personal visioning is the vehicle to use to know staff. How have you helped staff design personal visions? How do you support them to fulfill them? Shared vision is the most powerful place to take action! Every leader needs a set of visioning tools in their leadership toolkit. Leaders who engage with commitment actively in the process and genuinely lead it always do well in growing their organizations and influencing alignment. When staff feels ownership in the life of the organization alignment will surface. This helps minimize the number of resistors. Remember what organizational research says. You only need 33% of your staff behind an initiative to be successful. Of all the leadership challenges we face this may be the toughest of all. So many factors try to make you blink: Our own mental models of blaming outward, fear of Ministries and National mandates, the storm behaviors and all those siren voice trying to lure us onto the rocks. Learn to LOVE this period. If you don’t brave the storm you doom yourself to the events and patterns of behavior that are your current reality. So much learning occurs in the storm. Remember what gets you safely through storms. Be who you say you are everyday. Thunderbolts and collective pits are part of leadership. Being true to yourself will see you through. The really good stuff is always on the other side of the storm! Tell the truth! Our organizations are the way they are. Pretending they are something they are not portends no good end. Current reality is our ally, not our enemy. An accurate, insightful view of current reality is as important as a shared vision. If both are clear we can sustain creative tension and move closer and closer to the vision. If we don’t tell the truth about our current reality we begin to descend into emotional tension and watch the vision begin to erode. This becomes a powerful lesson leaders must teach – the current reality. How is your organization traveling at bringing to the surface the “un-discussible”, those potentially embarrassing and threatening issues that prevent you from learning? You and your leadership team must speak with one mind, one voice when you are out with the people you lead. We certainly hope your leadership group is a congenial lot! That always makes for better Friday afternoons. But congeniality doesn’t bring much to the transformation table. Collaboration is what is needed for change. And, at the heart of leadership team collaborations, are those brutally frank and honest conversations that go on behind closed doors. In the end it is essential that the leadership team make decisions about those issues they will be of one mind, one voice when they open the doors. How is your leadership team doing around this challenge? Every leader needs a shared visioning tool in their leadership tool-kit. Over my next several posts I will describe the shared visioning tool I have refined and refined over the past thirty years – the process that is currently used by more than 70 organizations across the globe. Wherever I have gone the beginning of building a shared vision has been a powerful organization happening. It begins with the Inquiry Probe experience. People often laugh at the name because after all, an Inquiry Probe is simply a question. I have always liked the word “Probe” because these are vital questions designed to “probe” deeply into the lives of everyone who participates. They must answer the Inquiry Probes together to draw from the organization their beliefs, values, aspirations and experiential knowledge, to form the basis for the shared vision of the organization. From many years of experience we have learned that eight Probes seem to work best. It is important that the Probes cover the key aspects of life within the organization. A key decision an organization must make is who will be invited to the shared visioning experience. Different organizations make different decisions in this respect. Most organizations try to ensure that all staff attends. Many organizations invite their Board members, key community leaders, cultural leaders, other community members. Schools invite parents, current students and former students. One rule of thumb that seems to work well is to ensure that the staff is not outnumbered by the other attendees. Be clear that who you invite, and who you do not invite, will send strong messages to your organization community. On the day those in attendance will work in groups of 7-8 people. Each of these groups has a facilitator attached to them to help them work through the Inquiry Probes. These facilitators must be trained in advance. The main criterion for this selection should be that they are people of high credibility and good interpersonal skills. The more diverse they are the better. Similarly, the more diverse the groups are the better. So, the leader needs to design the membership of the groups to bring about the maximum richness of interaction. As the groups work through each of the Inquiry Probe it is imperative that the leader provides them with powerful consensus building tools. We have always used two: classic brainstorming and 10-4 voting. The power comes from the tool’s transparency, fairness and equity. Every person presents their best answers to the Inquiry Probe as everyone else watches it happen and everyone has ten votes to spend to generate the final consensus. At the end of the Inquiry Probes experience the leader has the best thinking from the lived lives of everyone present answering the Inquiry Probes. This rich data informs the writing and development of the Shared Vision. 1. What key characteristics of Service Department Online’s history are going so well that we should continue to use them, and build upon them, for the foreseeable future? 2. What are the best ways to demonstrate to our clients that we provide diversity, innovation and close attention to their needs? 3. How can we continue to develop a culture where we value each other, respect each other, and provide direct feedback to each other in ways that ensure a successful Service Department Online? 4. What are the best ways for us to develop strategies to carry us forward? 5. What will be the key elements of the way we relate to clients so as to achieve maximum benefit for Service Department Online and our clients? 1. What activities by teachers most impact on deep student learning? 2. What benefits do we expect from parent and community involvement in our school? 3. What major innovations should we implement? 4. What are the best ways to ensure that staff, students and families have an appropriate balance in their lives? 5. How do we design for the success of all students in our school? “What a process! I have to admit I was very sceptical (what! Two days and 80 odd people to come up with a MISSION STATEMENT??) I thought that’s what the executive did!! Improvement begins with the shared vision creation experience. The vision touches the heart and soul of every staff member. It touches and sparks a renewed and positive organization climate. Much of my life has been spent studying and practicing the research of John Edwards, Jim Butler, James Nottingham, Peter Senge, Peter Block, John Kotter, James Kouzes, Barry Posner, Jim Collins, Art Costa, Victor Frankl and Michael Fullan. Each one speaks to the power of shared vision as the essential tool to guide change. Bow to the data created by these authors. Make your shared vision your FORCE! Caress it and hug it. Hang all action from it. Articulate it every day. If you make your shared vision the most important factor you pay attention to in your organization everyone else will as well. This journey is not easy. As I used to tell my staff, our answers are inside us. Lead your staff to find their own answers to build the organization you envision. This will ensure permanent change and protect you from “the quick fix” mentality that continues to limit organizational learning around the globe. Take your shared vision proudly into the New Year and make it your personal action mantra. Deep thinking is reflective and exhilirating. Bill Martin is Managing Director of Bill Martin and Associates, a U.S.-based company, which facilitates change in large organizations through the generation of powerful shared visions involving all staff, and implementation of the resulting long-term development plans. He has spent most of his career in senior leadership positions. Bill’s background is in education, both in public education and in universities. On two occasions he led large schools in low socio-economic, culturally diverse communities to win State and National awards for organizational excellence. These awards are given to only 300 U.S. schools annually from over 36,000 schools in the country. He is a sought after consultant and presenter in both education and business. Bill has worked in nine countries across a range of sectors, including education, business, health, juvenile justice, non-profit organizations and sport. He has presented invited addresses at International Conferences on Thinking in New Zealand, the U.K., USA, Australia and Sweden. One of his major current projects is the establishment of an international network of innovative schools spread across four countries.